Nuclear Microinjection Video 1 – mouse NIH 3T3 fibroblasts being microinjected in the Palazzo Lab. Microinjection is a powerful method that can be used to introduce almost any molecule (proteins, nucleic acids, cell extracts, small molecules, dyes, and drugs) into tissue culture cells. With some training researchers can even inject specific subcellular compartments, such as the cell nucleus. This instrument can be used to study how cells organize their three dimensional space, for example, how newly made mRNA is transported from the nucleus to its proper destination in the cytoplasm. Moreover microinjection can be used to introduce foreign DNA into tissue culture cells in order to rapidly express genes of interest. DNA injection has many benefits over conventional transfection protocols in that 1) any tissue culture cell can be injected, even hard to transfect embryonic cells; and 2) microinjected cells express protein 1-2 hours post-injection whereas transfected cells take anywhere between 18-48 hours before exogenous protein can be detected. 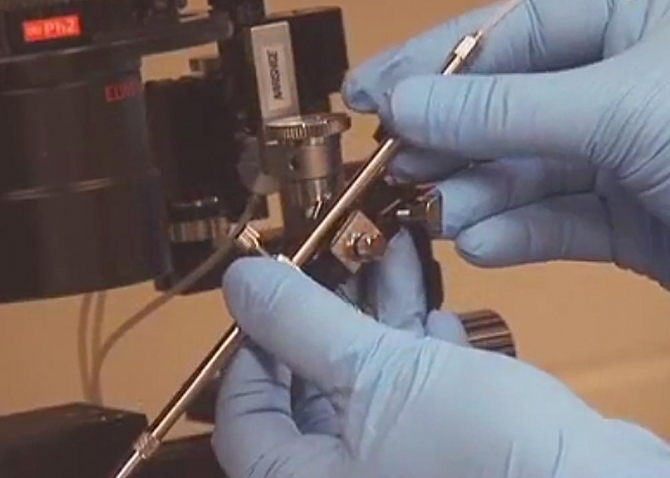 Inverted Nikon Ti microscope stabilized on an air table and equipped with a Narishige hydraulic manual micromanipulator for somatic cell microinjection. The microscope also has a camera and monitor for instructional use. Epi-fluorescent inverted Nikon Ti microscope stabilized on an air table with both CCD 14bit and EMCCD cameras. Imaging computer equipped with Nikon NIS elements. Sutter needle puller for generating custom made microinjection needles. Table top preparative centrifuge for preparing microinjection samples. Tissue culture hood and incubator for maintaining microinjected mammalian tissue culture cells. Gueroussov, S., Tarnawsky, S. P., Cui, X. A., Mahadevan, K., Palazzo, A. F.
Analysis of mRNA Nuclear Export Kinetics in Mammalian Cells by Microinjection. J. Vis. Exp. (46), e2387, doi:10.3791/2387 (2010). The video above describes an assay that employs the power of microinjection coupled with fluorescent in situ hybridization in order to accurately measure the nuclear export kinetics of mRNA in mammalian somatic cells. Nuclear Microinjection Video 2 – mouse NIH 3T3 fibroblasts being microinjected in the Palazzo Lab. Assessing mRNA nuclear export in mammalian cells by microinjection. Lee, E.S., and Palazzo, A.F. The consensus 5′ splice site motif inhibits mRNA nuclear export. Lee, E.S., Akef A., Mahadevan, K. and Palazzo, A.F. PLoS One. 2015 Mar 31;10(3):e0122743. Trafficking of mRNAs containing ALREX- promoting elements through nuclear speckles. Akef, A., Zhang, H., Masuda, S., and Palazzo, A.F. Mahadevan, K., Zhang, H., Akef A., Cui, X.A., Gueroussov S., Cenik, C., Roth F.P. and Palazzo, A.F. PLoS Biology 2013, 11(4): e1001545. p180 Promotes the Ribosome-Independent Association of a Subset of mRNA to the Endoplasmic Reticulum. Cui, X.A., Zhang, H., and Palazzo, A.F. PLoS Biology 2012, 10(5): e1001336. Genome analysis reveals interplay between 5’UTR introns and nuclear mRNA export for secretory and mitochondrial genes. Cenik, C., Chua, H.N., Zhang, H, Tarnawsky, S., Akef, A., Derti, A., Tasan, M., Moore, M.J., Palazzo, A.F., and Roth, F.P. PLoS Genetics 2011, 7(4): e1001366.